What Digital marketing and CRM strategy would an ancient Roman design? Patrician houses weren’t just living spaces in Ancient Rome; they were the main place of business. Every morning, the head of the household would receive clients and petitioners at his home. In Rome, business was intensely personal. Today, most B2B businesses are relationship-driven too. By and large, we do business with people who know us, like us and trust us. Communication makes people remember you. Administration makes you remember them. Roman patricians didn’t sell. They managed relationships that endured for a lifetime. So should businesses; in effect, investing in Customer Relationship Management (CRM) buys additional sales now and in the future. To manage lifetime relationships, businesses really just need three things: communication, administration and integration. Communication makes people remember you. Administration makes you remember them. Integration supported through digital and CRM system pulls it all together, resulting in sales. Most business people I talk to say they spend about 30% of their time in meetings. Assume they work 8 hour days, 200 days per year, and meet a person on average 3 times in a year for an hour. That means meetings with 160 people annually. Add in events, workshops, business trips, email, social media and phone calls and they could be interacting with 3,000 people in a year. As a business, you need to be top of mind when somebody needs something that you can fulfil. Consistent, helpful communication with your prospects, clients, agents and peers helps you be more than a three thousand to one statistic. Communication is cumulative; strong brands are not built in a single campaign. Consistent communication over months and years helps you be remembered. Whilst I don’t recommend daily communication, I don’t think it’s an accident that the Roman custom of receiving clients was every day. Most business people spend their time making or selling stuff. Time poverty means that boring-but-supremely-important relationship housekeeping doesn’t get done. Business cards gather dust, emails get archived and people forget they ever met you. A Roman noble would have found this a baffling way to do business. Admittedly, he would probably have bought slaves to solve the issue. For small businesses there are two solutions. The first is to use systems that make administration as efficient and effortless as possible. The second is radical simplicity in your relationship marketing approach. Scanning contact card details straight into the CRM via an iPhone. Integrating CRM and accounting systems to eliminate significant chunks of financial management. Compiling a monthly eNewsletter automatically from your website posts. Calendar integration allowing contacts across companies and email systems to see your availability and request meetings. Importing commenters and enquirers from your website into your CRM, automatically. Cloud based services to avoid IT maintenance and security headaches. Marketing has got more and more complex. The general direction of customer relationship management is towards mass-customised segments of one. Fine if you have a thousand-strong marketing team and big IT. Fine too, if you believe the world works on exclusive, targeted, push messages. I don’t. I think the web obeys rules of attraction. People find the content they want based on its relevance to them. I also believe passionately in doing more with less. Be clear about your proposition, produce relevant, helpful and authentic content and you might not even need to segment. Radical simplicity comes from having a single corpus of content and using no more customer segments than are absolutely necessary. Radical simplicity also comes from having just one single corpus of content. You really don’t need to manage separate content for your website, Twitter feed, LinkedIn profile, Facebook page, eNewsletter and marketing campaigns. For a few pounds a month small businesses and freelancers can use a CRM system that would have cost six-figures ten years ago. If the core principle of business is relationships, then don’t be constrained by an inflexible data model based around sales funnels. The model needs to be flexible enough to model the complexity of real life. But also simple to use. If business is built on personal relationships, then CRM systems really needs to aggregate social media like LinkedIn, Facebook and Twitter feeds into contact records. If we’re time-poor, then we need contact, project and task management to put an administrative steel-frame around our business. We need as much ambient administration functionality as you can shake a stick at. We also need integration between our CRM system, our website, our accounts and eMarketing systems to eliminate pointless work. 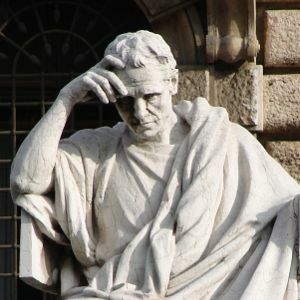 I don’t think an Ancient Roman would have understood the technology, but we’re pretty certain they would have been familiar with the relationship-first principles behind our CRM approach. Good illustration on CRM. I like it! Thank you, you’ve explained and reinforced my thoughts and given me insights about integration very well.